You can see how that went after the gallery. Given how much I dislike early morning flights, I’m still slightly puzzled as to how I ended up starting my trip to Japan with a flight that left Manchester at 08:40 and returning on one that left at 08:50. This is annoyingly bad planning (well, budgeting) on my part! As is typically the case for me, no matter how early I have to get up for a flight, I never seem able to get to bed at a reasonable hour the night before. In this instance, I was still up and packing well past midnight, only to be up again at 06:00 and out of the hotel by 06:15. Although it’s generally quicker to get to Haneda from the centre of Tokyo than it is to get to Narita, it’s usually less straightforward. In my case, it took three trains, whichever route I went, unless I wanted to pay for a taxi or airport limousine (which I didn’t) or catch an airport shuttle bus from one of the major hotels. These are generally slower and much more expensive than taking trains, but usually mean fewer changes, going direct from the hotel to the airport. Shuttles aside, I had at two main routes to the airport. The first was to effectively retrace my steps from the journey in two weeks before on the monorail. A variation on this was to hook up with the monorail at one of its intermediate stations, Tennozu Isle, which should, in theory, have been quicker. The second main route was to use the Keikyu Line, one of Tokyo’s many suburban rail lines, to get out to the airport, which is the one I ended up taking. All of these options involved me getting the metro from Hiro-O, a station less than 10 minutes’ walk south of my hotel, and going one stop to Ebisu, where I transferred over from the metro to the train station and faced my first choice. I could catch the Saikyo Line to Osaki, where it continued to become the Rinkai Line, which would get me to Tennozu Isle and the monorail. In theory, this was the quickest route, except that the trains only run every 20 minutes and I’d just missed one. Instead I jumped on the more frequent Yamanote Line, where I could carry on to Hamamatsucho and the start of the monorail, a total of six stops, or jump off at Shinagawa, which was four stops, and transfer to the Keikyu Line, where I’d get the Haneda Express, one of four different trains running on that line. As you will have seen from the gallery, I’d been on that line two days before and, being unaware of the various options, got on the wrong train. That time I’d wanted to go one stop on a local train and instead caught an express which didn’t stop until it reached Keikyu Kamata, ironically where the line to the airport branches off from the main line. Google Maps told me that the Shinagawa/Keikyu Line was the best option, so that’s what I did, ensuring that I got on the correct train, the Haneda Express, which runs every few minutes. I caught the 06:55 train and 25 minutes later, rolled into the airport, slightly later than I wanted, but still 1½ hours before my flight was due to leave. Even though it was early on Friday morning, the trains were still crowded. While the metro was relatively quiet (see the gallery), the Yamanote and Keikyu Lines were jam packed, with me and my (very large) rucksack literally squeezing on in both cases, which explains why there are no photos of the rest of my journey in the gallery! I’ll leave you with a final note about cost. It’s hard to give an exact price because I paid with my Pasmo card, each leg of the journey was separately charged and I wasn’t keeping a close eye on my card balance. However, the total cost, of all three legs, was less than £5, which is pretty decent. You can see how I got on at the airport after the gallery. I reached Haneda at 07:20. I wouldn’t describe it as a small airport, although the international departures area feels smaller than I remember Narita from the previous year. However, it is a very compact airport and easy to get around. From the train station, it’s a couple of minutes to the check-in desk (and the British Airways check-in desk was at the far end) where I found a very short queue (of one person). Five minutes later I was checked-in and ten minutes after that, at 07:35, I was through passport control and security. By this point I hadn’t had breakfast, so I popped into the lounge, which, unlike Bangkok, was well-signposted, easy to find and on the way to my gate. A large, spacious affair, there was plenty of lounge seating off to the left, with the food area on the right, where there are also computer desks. I sat here with my breakfast, a Japanese-style one, enjoying some views out over the gates. We were supposed to board at 08:10 and by 08:15, the departure board was saying “departing soon” so I thought I’d better head off for the gate, remembering the long walk from the gate when I arrived two weeks ago. I got to the gate at 08:20, wandering through the spacious departure halls. Although I didn’t have to spend any time here, it looked pretty good, with lots of space, scattered seating, and plenty of power outlets (which you can also stand up at, quite important to me given my recent back troubles). The gate is down a level, with its own seating, and, pleasingly, plenty of power outlets, although there weren’t enough seats for a full 777. Not that this seems to matter, since so many people are determined queue. There was already a long queue for economy when I arrived and it just got longer as we waiting. We finally started boarding at 08:30 and after letting the initial surge of first/business class passengers queue up, I trotted on at 08:35. British Airway’s Boeing 777-300s have four cabins, with First Class at the front, with its own galley next to the cockpit. Next comes the Club World galley, followed by seven rows of eight seats. After that is an even smaller World Traveller Plus cabin with just six rows, while the rest of the plane is given over to World Traveller, with 20 rows and just one galley (for 200+ passengers) right at the back. It really is a very different world up in the front of the plane and one I’m trying not to get too used to. First Class had its own air bridge at Haneda, boarding directly into their little section at the front, while the rest of us boarded through the galley in front of the Club World cabin, a useful tactic in the envy stakes, since it means that everyone at the back files through Club World on their way to their seats. On the flight out I’d got my favourite seat, by the window at the back of the cabin. However, both of these were taken so I booked 10K, another window seat, but this time right at the front of the cabin. In my defence, I didn’t have a lot of choice, but with hindsight, I should have paid more attention to the Seat Guru notes which describe it as having a “misaligned window”. This is Seat Guru speak for no window at all, since exactly where you’d expect a window to be, to the left of the seat, is a blank bit of bulkhead, the window having been inexplicably missed out. No doubt this is for perfectly good structural/safety reasons, but it was extremely frustrating for me. Although the seat has two windows, the first is behind the seat and can’t be seen due to the seat’s hard plastic casing, which totally obscures the view of the window. If I wanted to see anything out of that window, I really had to crane my neck. The other window is set so well forward of the seat that from my normal position, I couldn’t see anything except an engine, having to lean right forward in my seat for any sort of view. Once we were airborne, I did experiment with the seat position, but you can’t really move the seat backwards or forwards. Moving the seat “forwards” also drops the back of the seat down into a reclining position, so it didn’t help me see out of the window! I really wanted to move the whole seat forward without changing its shape, but that’s not one of the options. Even when I move the seat forwards, the casing, which blocks the view of the window behind me, is fixed, so no matter what I did with the seat, it always blocked the view. I spent a long time playing with the seat controls and still can’t figure them out. There are, in all, 10 buttons. The first two slide the seat backwards and forwards. The next pair both seem to slide the seat forward, while the blue one puts it into the correct position for take-off and landing. The next one (which has a picture of an upright seat) seems to slide it backwards, while, as far as I could tell, the last four do nothing at all. The whole panel could probably be replaced by three buttons, the first pair and the blue button. As you can probably tell, by this time I was very grumpy indeed. On top of my complaints about the windows, this was a standard seat Club World seat, which meant that I had to climb over the person outside/behind me (11J) to get in and out of my seat. Given that I’d deliberately picked the seat so that I could have a view, I may as well had an aisle seat, where I could have at least got in/out without any trouble. And to add insult to injury, I had a wonky armrest which was, in my grumpy state, immensely annoying. Sadly, the Club World cabin was completely full, otherwise I’d have considered moving. However, once we were underway, I decided to stop being such a grump. In my defence, I was really tired, having had less than five hours of sleep that night and six hours the night before. However, being grumpy was not getting me anywhere, so I decided to enjoy what I had. I’ve written extensively about British Airways’ Club World seats, so I won’t repeat myself, but there’s just so much more room than there is in economy and much more privacy, especially in the window seats. When the divider between the seats is up, you really are in your own little world, so much more than if you had an aisle seat. So I settled down to enjoy the flight. Boarding was complete by 8:45, which was impressive given the queues. However, we were already late, pushing back at 08:55, before playing the taxi game for 15 minutes. This gave us time to watch the safety video, which has the bonus of being quite funny, starring comedian Chabuddy G and featuring the likes of Rowan Atkinson, Gordon Ramsay, Gillian Anderson, Ian McKellen and Warwick Davis. Although I’ve seen it a few times over the last year, I still enjoy it. I also managed to see the new version (starring Joanna Lumley and Michael Caine) on the flight from Manchester to Heathrow on my way out two weeks before. The cabin crew took their seats for take-off at 09:10, and we were in the air at 09:15. We got a good view of the airport as we turned over the harbour, but then went almost immediately into cloud, so maybe not having a window wasn’t such a bad thing. The seat-belt signs came off at 09:30 and five minutes later we left clouds behind, flying over some lovely mountains and then clearing the Japanese coast at Niigata. There were some great views, although most of the photographs in the gallery were taken by holding the camera over my left shoulder/around the side of the seat casing, or by leaning right forward in my seat. The pilot gave us an estimated flying time of 11 hours, 10 minutes, which meant that we would be early into Heathrow, despite having left a little bit late. Aware that I was grumpy, I decided to have some coffee (my first of the day) to see if that would perk me up, which it did. This was another from Union Hand-roasted’s tie-up with British Airways and was actually a pretty decent cup, given the challenges of making coffee in the air. I then decided to watch a movie (Three Billboards Outside Ebbing, Missouri) while I waited for (and then ate) my lunch. The meal had been cleared away by 11:30, with the blinds coming down at 11:40 and the cabin lights going down at 12:25. We had a couple of shorts spells of turbulence where the seat-belt signs came on, but they didn’t last long. I had a second cup of coffee, but it was nowhere near as good as the first, coming out a bit thin. At 13:10, struggling to keep my eyes open, I decided to have a short nap, which was only really about 90 minutes but seemed to do the trick. By 14:45, I was up and about again and we were, no surprise, still flying over Russia. You can see what happened during the remainder of the flight after the gallery. Although it was mid-afternoon Tokyo time, I was trying to make the mental adjustment to UK time, which was 06:45, a little early to be getting up, but not ridiculously so. Hopefully this would leave me tired when I got home so I could go to bed at a sensible time (22:00 say) and get a good night’s sleep. In the meantime, I decided to get on with some work. After an hour or so, at 16:00 (08:00), I made some coffee. They were a bit busy in the galley, so I took my hot water and went into the toilets to make my coffee, using the baby changing table as my stable surface. Had the lights been on in the main cabin, I’d have probably just gone back to my seat, but ever since I was told off (literally) for grinding my beans too loudly on a night flight from the US, I’ve tried to avoid grinding beans at my seat. So I retreated to the toilet with my Aergrind and Travel Press, although annoying I forgot my phone so had to count to 240 (4 minutes) rather than time my coffee. I took my Travel Press back to my seat, along with a cup I’d picked up the galley, although I didn’t get any biscuits this time. In fairness to British Airways (and Union Hand-roasted), having criticised the second coffee I had, my coffee wasn’t very good either, certainly better than the second cup I had, but probably not as good as the first one that I’d had at the start of the flight. Me 1, Union/BA 1. I had an inadvertent nap after my coffee, waking up at 18:00 (10:00), at which point we were crossing over Finland. The crew came out and turned the lights on at 18:55, not long after we had crossed the southern Finnish coast, taking a slightly more southerly route back than we had on my flight out. Breakfast (dinner? lunch?) was served five minutes later, with a starter of fruit and feta cheese which arrived as we flew over southern Sweden. A hot course followed, another pasta dish, this time a penne in a tomato sauce. This was served at 19:25 was we crossed over from Denmark to Northern Germany. Everything was cleared away by 19:50, as we approached the Dutch coast, 40 minutes out from Heathrow. We crossed the Essex coast with 20 minutes to go, at which point water started dripping on my head. It turns out that this was the air conditioning and, from the way the crew reacted (I was handed a towel), this was pretty routine. Another reason not to sit in seat 10K! We did a couple of holding manoeuvres over central London, including an S-turn right over Hyde Park, which gave me some lovely views, but then it was straight into Heathrow, touching down at 20:40, Tokyo time, 12:40 local time, exactly half an hour early. Unfortunately this meant we had to wait on the apron for our gate, and, when we did get onto the gate at 13:00, we had to wait for the air bridge, although at least they were unloading the bags while we waited. We’d landed at the C Gate block, so I caught the transit back to the main gates, and within 10 minutes of leaving the plane, I was at flight connections and then passport control, followed by the fast track for security (I suspect that all incoming flights from outside of the UK require you to go through security before boarding a connecting flight). In less than 15 minutes I was into the departure lounge with time to kill, so I head for the north lounge again, getting the same seat as I had when I flew out. It was now 13:40 and my flight wasn’t due to leave until 16:00, so I got some coffee and settled in, this time trying a Union Hand-roasted cappuccino, followed by an espresso, which, I have to say, weren’t as impressive as the coffee I had in the lounge on the way out. Having spent two weeks in Japan during its hottest ever heatwave, I arrived back in the UK at the tail end of its own heatwave, with temperatures around 30⁰C. 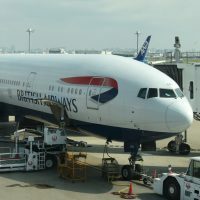 However, it was definitely the end of the heatwave and thunderstorms were rolling in, which started to play havoc with the flights, with inbound flights from Europe being delayed by the weather, followed by the consequent knock-on effects on outbound flights. In many ways, I got off lightly since my flight was only delayed by 35 minutes. Even better, the delay was up on the board before I left the lounge (it was also, for once, on the British Airways app) so I just stayed put, quite happy with my perch in the lounge. That said, some genius had decided that the best place for the children’s play area was right next to the business area, where people were trying to get on with some work or make conference calls. Meanwhile, in the next room, a group of small children were playing loudly, in the way that small children do. It wasn’t their fault (particularly not when I learnt from their father that they’d been in the lounge for nine hours) but I’d love to have a quiet word with the muppet who thought this was a good layout for the lounge. You can see what happened on the flight after the gallery. As I had on the flight down from Manchester on the way out, I’d gone for a window seat, this time selecting 4F. This time the flight was almost full, with every seat in Club Europe (admittedly only 20 seats) taken, bar one, which was the one next to me, so that was handy. Boarding was complete by 16:35, but then we sat at the gate for 25 minutes, so I got my laptop out and did some work. The Club Europe cabin is not blessed with a lot of room, but it was better than sitting in economy, since my legs weren’t actually touching the seat in front on me. Although the seats are still in rows of three, the middle seat is turned into a table in Club Europe by the addition of an insert between the armrests. If there had been someone sitting in the middle seat, leg room or no leg room, I’d have chosen an aisle seat. This is partly to allay my mild claustrophobia, but mostly so that I can use my laptop. Even with the extra legroom, the seat in front is so close that I can’t fully open my laptop and I can’t get the keyboard very far away from me. Ii I want to type, I need lots of arm room to either side, impossible if I’ve got someone sitting right next to me, which is why I normally sit in aisle seats on short-haul flights. At 17:00 the pilot told us that we weren’t going to start our engines until 17:30, at which point the lady in the seat in front of me decided to recline her seat. There wasn’t much room to start with, so that was that as far as the laptop was concerned,. Fortunately, I had the spare seat next to me, so I just shuffled over to the aisle seat and carried on working. Having been told by the pilot that we weren’t going anywhere, everyone, pilot included, was surprised when, 10 minutes later, we pushed back. Our poor old Airbus A319 didn’t have any TVs (or if it did, they weren’t working), so we got a manual safety presentation. The safety brief was clearly read from a standard script, including “devices must be disconnected from power when not in use”. Not that there’s any at-seat power in an Airbus A319…. We trundled off, playing the usual taxi game, and reached the end of the runway queue at 17:25, finally getting onto runway at 17:35. We were just starting our take-off run when we swung off the runway and back onto the apron. No!!!! You can see whether we actually took off after the gallery. By now, the passengers were starting to get really antsy, but I have to commend the cabin crew, who were firm but polite throughout. Once it was clear that we weren’t going anywhere, the pilot powered the plane down and switched off the seat-belt sign. People were then free to get up and move about, which calmed things down a bit. I was very glad that I was in Club Europe, because, unless I was in an exit row seat in economy, my claustrophobia would have been getting the better of me by then. We got underway again at 17:55 after 20 minutes on the apron. At least we were pretty much first in the queue, and we took off five minutes later. The flight to Manchester is always a short one and one of the reasons for getting a window seat is that we never get that high, so you get some pretty decent views, particularly of the hills east of Manchester. Even better, all the sunshine had dried off the windows, so the views were excellent. For more about this trip, including all the Coffee Spots I visited, please see the Travel Spot Page.